The people sitting across the table from someone like Dwyane Wade or Donovan McNabb working on an endorsement deal aren’t usually the same people sitting in a living room across from a mother whose son has just been shot and killed by the police, but one Northwestern Pritzker School of Law alumnus has built a career doing exactly that. After over a decade and a half as a successful agent, Andrew M. Stroth (JD ’99) decided he wanted to move beyond the sports and entertainment worlds, and created the Action Injury Law Group, a civil rights firm focused on filing federal Section 1983 cases on behalf of victims of police-involved shootings and injuries. “Two years ago, God gave me a vision to create a civil rights law firm. Since I’ve become a lawyer, I get asked by a lot of people when they have legal problems or questions, who they should go to,” Stroth said. Andrew Stroth and his client Tambrasha Hudson, whose son was killed by police. Stroth’s firm represents victims or their families in five high-profile police-involved shooting or injury cases pending in the Chicagoland area currently, including the case of Pierre Loury, a 16-year-old boy shot and killed by a Chicago police officer in April. Action Injury also currently represents: Rayshon Gartley, a young man receiving treatment in the psychiatric wing of Jackson Park Hospital who was captured on surveillance video being beaten while handcuffed by a Chicago police officer in 2014; the family of Justus Howell, a 17-year-old boy who was fatally shot by a Zion police officer in 2015; the family of Charles Hollstein, a 38-year-old man fatally shot by Zion police in 2016; and the family of Martice Milliner, a man who was shot and killed by Chicago police in 2015. Stroth’s vision for the firm is to provide access to quality legal representation to those who don’t often have it, to provide justice to those who don’t often get it. 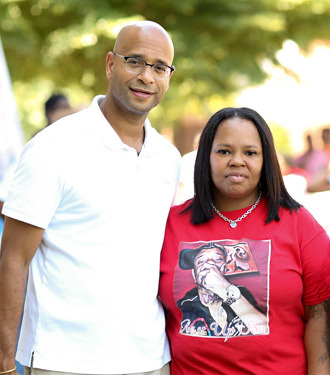 At a July event celebrating Loury’s life and what would have been his seventeenth birthday, Loury’s mother Tambrasha Hudson explained why she chose Stroth’s firm. “In the midst of everything that was going on, I had several lawyers come to me. There was a lot of confusion going on. But when Andrew came, he calmed the storm, and we just agreed as a family that he would be a better lawyer for us,” she said. Stroth believes his time as a student at Northwestern Law and the relationships he’s sustained since have both contributed to his successful career thus far and will continue to benefit him as he continues down this new path. As a student, Stroth was involved in the Bluhm Legal Clinic and even helped bring then-State Senator Barack Obama to speak at Lincoln Hall during the Law School’s Diversity Week in 1997. He has also taught as an adjunct professor in the Clinic’s Center on Negotiation and Mediation. Looking ahead, Stroth is optimistic about the difference Action Injury can make—even hoping to one day put himself out of a job. The desire and hope for change is something Stroth and his clients share.